Dynair Air Handling series is the new generation of Air Handling Units from Dynair. These units are designed to meet the environmental, hygienic and engineering demands of the new era. The Air Handling Units are based on the modular paneling concepts to offer a wider range of units, versatile and suitable for any comfort or industrial application. The DAH series has a total of 18 unit sizes with airflow ranging from 1500 to 40,000 CFM and a total static pressure up to 1500 pa (6” WG). DAH units are suitable for both indoor and outdoor installations and are a perfect choice for mosques, schools, hospitals, cinemas, supermarkets, residential and industrial buildings. All units are packed in modules and are wrapped with PVC film. The sections with total height or width exceeding the container size will be delivered in CKD form. For more information on Dynair Air Handling Units, Please Download Catalogue Here! IAQ deals with the content of interior air that could affect health and comfort of building occupants. The IAQ may compromise of microbial contaminants, or any mass or energy stresser that can induce health effects. In many large, commercial, and conditioned spaces the occupants have virtually no control over their environment, The space could be filled with dust, smoke, chemical vapor, pesticide sprays, fine carbon dust from copying machines, etc and we may not even know about it. Due to the pollutants mentioned above, it has been observed that air in a conditioned area can be up to ten times more polluted than the air outside, which may pose a great health risk due to its high level of concentration.Therefore, it is safe to conclude that the IAQ plays an important and major role in the health state of the conditioned spaces we work and live in. Dynair AHU ensures your “IAQ” requirements to make your environment fresh and healthy. The construction of Air Handling Units are of pentapost design and have strong three way angle joints of reinforced nylon corners to form a rigid frame structure. Nylon corners ensure the thermal break effect on the comers of the struc¬ture. Rigid framework comprises an assembly of externally chamfered extruded aluminum profiles & nylon corner joints. Thermal Break Profiles are used to eliminate the heat loss caused by thermal conduction from the exterior surface to the interior of the casing. These options are generally advised for outdoor installations. The outer skin is a standard pre-coated Gl sheet & inner skin is a Gl sheet or S.S Sheet. The double skin is to retain the insulation, keep the internal surface clean and to have a smooth surface. This eliminates the chance of dirt and bacte¬ria accumulation. Thus it is suitable for hygenic applications such as pharmaceutical industries, hosiptals, operation theatres, surgery rooms, food processing industries etc. The insulation comprises of fibre glass with a density of 40-48 kg/m3. The panels are also assembled with imported self-drilling & self tapping screws which are fixed to the frame and easily removable. Optional: Injected insulation of Poly Urethane Foam (PUF) of 40 kg/m3 density. 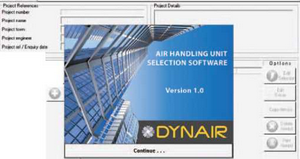 DYNAIR’s AHU Selection Software provides the complete details of design and submittal generated for the Air Handling Units. The system is integrated so as to eliminate wherever possible the re-entry of information and thereby minimise data entry errors. The program is user-friendly and maintained wherever practical for the customers. The software intelligently selects the optimum requirement of Air Handling Units from our standard database and selects the optimum selection as per the customers’ specifications. The software will carry out the calculations and generate sufficient information to have variours options available within the program.